Every political season brings the same old ideas about what government should do and how it should operate. This election brings a decision between operating government like a business and the discipline it requires, or operating it as an entity that transcends the typical rules of budgeting, balancing, and funding for the greater good of the people. Many have tried over the years to hybrid the two and reinvent government by instilling some sense of discipline to balance revenue and spending. It has rarely worked. I have always found it fascinating that the candidates who often run on a platform of reforming government are the same one that have been in office term after term and nothing has changed. This may explain NASA’s predicament. Since Richard Nixon transformed NASA from a deep-pocketed, goal oriented agency to a limited budget, keep the lights on, do something is better than nothing approach, NASA has struggled to find its way. Often a political football, its mission and funding are dangled in front of voters in key states important to the space program. Over the past forty years, politicians never seem to get it right. NASA is one of those agencies where politicians wave the flag and point to the achievements of the past while paying lip service to the future. It is no wonder that NASA or the public isn’t clear on a future direction. At any given time, those that control NASA’s funding and those that control NASA’s leadership will give different opinions and answers. Moon or Mars? NASA built or Commercial Transport? Robotic or Human Spaceflight? NASA incurs costs and delays every change in Presidential or Congressional Leadership. Current plans or work must stop and new plans must be developed only to be changed because they cannot be completed before the next change. In retrospect, with the constant churn in NASA’s focus what is amazing is that anything could be accomplished at all. Let’s take a step back and briefly look at what has transpired since Apollo 11. 1969 - Kennedy challenge fulfilled. America lands humans on the moon and returns them safely to Earth. 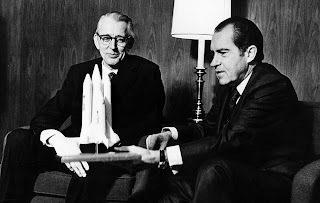 1970 - Nixon rejects post Apollo strategy for space stations. moon, and Mars. Cancels remaining Apollo lunar missions. Nixon considers an end to human spaceflight in lieu of robotic missions. He rejects Vice President Agnew's recommendation for a manned Mars mission. He finally accepts limited human spaceflight. He states NASA will be "bold, but balanced". 1973 - Skylab I launched. Skylab architecture is built for multiple lab launches. A "use and discard" approach that assumed when it was designed in the 60's, the availability of the Saturn V. Each Skylab is not built for resupply missions. 1973 - Skylab II program cancelled. NASA elects not to launch completed Skylab II due to costs of launch and to divert funds to Space Shuttle Development. 1974 - Fourth Skylab I Mission Cancelled. Nixon directs last use of Saturn 1B for Apollo-Soyuz Test program as part of his Soviet outreach of detente. NASA concerned over technology transfer to Soviets. 1974 - Third and final Skylab mission ends. Total Skylab development and operational costs $2b. 1974 - NASA dismisses talk of a future role for Skylab due to budget choices, Skylab architecture, and Shuttle development funding needs. 1975 - Apollo-Soyuz Test Project. Last flight of Apollo hardware. 1976 - Carter elected. First President during the space age where America does not launch a human into space. 1975-1981 For the first time since the Mercury program, America has no access for humans to space. 1978 - NASA study shows Skylab is safe for crews. With Space Shuttle planned to be operational in 1979, a Skylab rescue is planned. It will be a risky early test of the Space Shuttle and spacewalking astronauts to save Skylab. Skylab/Space Shuttle seen as building capability for working and repairing a structure in space as well as gaining access to a space station in an era of constrained budget. 1978 - Apollo 13 Astronaut Fred Haise trains for 1979 Space Shuttle Skylab rescue program. Haise is projected to be the mission commander. 1979 - Carter considers canceling Space Shuttle, but elects to cut the construction of five orbiters to four. 1981 - Reagan becomes President. 1981 - Space Shuttle era begins and launches with no destination. Nixon cancellation of post-Apollo strategy has Shuttle performing as the “Swiss Army Knife” of spaceflight. 1982 - After early success of the Space Shuttle, Reagan declares it is "operational" after just four flights. Reagan orders that the shuttle carry all government payloads, that all payloads be compatible with the shuttle, and that the Department of Defense have priority access on the shuttle's manifest. 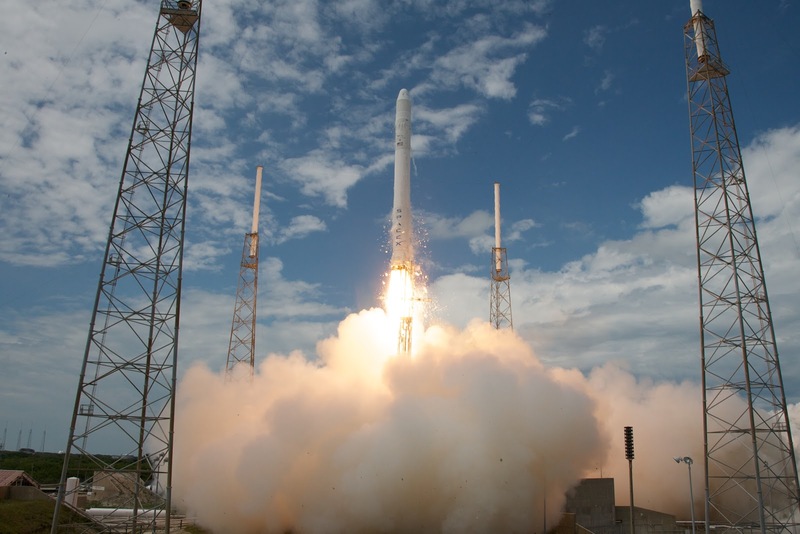 Other agencies will use expendable launch vehicles until a transition to the shuttle is completed. Original shuttle economics drive the phase-out of expendable launch vehicles over the frequent, reusable shuttle. 1984 - In the State of the union speech, Reagan directs NASA “to develop a permanently manned space station and to do it within a decade”. Space Station Freedom is born, at least on the drawing board. 1986 - Challenger Disaster occurs on the 25th launch of the Space Shuttle program and stands down the Space Shuttle program for two years. Earlier directive to move payloads to the shuttle and problems/phase out of expendable launch vehicles cripples US access to space in any capacity. American reliance on a single platform created a gap in the event of failure. Review of Shuttle program points out NASA organizational flaws, but also find major deficiencies and safety issues with the Space Shuttle. Vehicle deficiencies attributed to design and costs constraints. 1988 - Reagan's revised space policy raises commercial space to the level of civil, defense, and national security sectors. Policy backs off of shuttle as a single solution and directs the return of expendable launch vehicles to supplement the shuttle. The shuttle program loses its largest paying customer, the Department of Defense. 1989 - George W Bush becomes president. 1989 - On the 20th Anniversary of Apollo 11’s lunar landing, Bush proposes the Space Exploration Initiative. The SEI includes the building of Space Station Freedom, a return to the moon, and a mission to Mars. 1989 - Space Station Freedom redesigned, budget cut. 1990 - Augustine Commission Review of NASA commissioned by the White House states “NASA is currently overcommitted in terms of program obligations relative to resources available – in short, it is trying to do too much." 1991- Shuttle’s planned 10 year life expectancy milestone passes with just 39 of originally planned 400 flights achieved. Shuttle program continues with no planned end or replacement strategy in place. Once a week shuttle launches never materialize. 1991 - Space Station Freedom cancelled. NASA had spent 10 years and 11 billion dollars on the station without a single piece of flight ready hardware for the effort. Over the 10 years the Space Station proposal underwent seven major redesigns to accommodate the President, Congress, costs, scale, and weight. 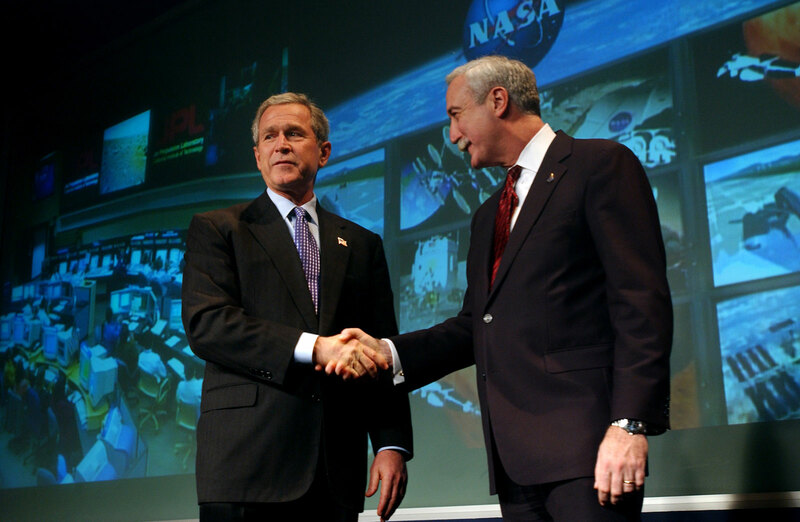 1993 - Bush leaves office and the Space Exploration Initiative is dead having garnered little support. 1993 - Space Station Freedom gets a reprieve. Clinton requests three designs from NASA; good, better, best model, with the least expensive costing $5 billion, and the most expensive option not to exceed $9 billion. Clinton selected the least expensive option and modified the cost to not exceed $6 billion. In a cruel twist for NASA, the option selected by Clinton was close to the original design of Space Station Freedom. Ten years had been spent and wasted on redesigning the station, only to come back to square one. 1993 - Clinton determines all space station options are too costly. Proposal to cancel the Space Station goes to Congress and survives by 1 vote. Elects to form US-Russia space station partnership. 1994 - Reagan’s original NASA directive to build a space station in a decade passes and America still does not have a manned orbiting outpost. 2003 - Columbia Disaster stands down manned spaceflight for the second time. 2004 - President George Bush mandates Shuttle retirement and proposes the Vision for Space Exploration that includes two new launch vehicles under the Constellation program (ARES-1, ARES V) and a return to the moon by 2015 and Mars by 2020. Bush Propose an extra $1billion for NASA and diversion of dollars from existing NASA programs to fund development. 2005, NASA unveils the Constellation program launch vehicles and spacecraft, they include the Ares I launcher, Orion crew capsule, Ares V heavy-lift rocket and Altair lunar lander. 2009 - Obama appointed Augustine Commission reviews current U.S. Space Policy and produces final report. Commission finds that NASA likely cannot meet the 2015 launch of astronauts to the ISS using the ARES-1 and cannot meet a 2020 return to the moon. Report states exploration beyond low-earth orbit is not viable with current budget, but achievable with an additional $3 billion per year. ARES-1X test flight flies with dummy upper stage. Flight conducted to test Solid Rocket Booster (although it flies with a 4 and not a 5 segment booster as planned), rocket stability, and collect flight data. Flight deemed successful. Cost to development one and only test flight. $445 million. 2010 - President Obama cancels Constellation Program including ARES-1, ARES-V, and Altair. Over $10b in development and procurement commitments had already been made on the program. Obama proposes funding for extension of ISS through 2020. Upholds planned Shuttle retirement and abandons return to the moon as a “been there, done that”. Supports commercial companies to ferry American astronauts to low Earth orbit. 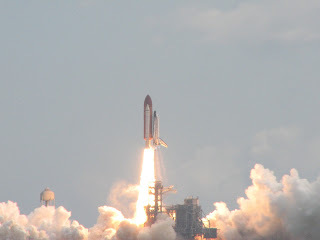 2011 - Space Shuttle era comes to an end after 135 flights with the launch and safe return of Atlantis. 2011 - International Space Station is completed at a cost of $100 billion dollars and the involvement of 16 nations. 2011 - Russia raises costs of flying on Soyuz/TMA to $63 million dollars a seat. Shuttle costs were estimated at $500 million to $1 billion per flight. 7 astronauts x $63 million = $441 million, not counting the cargo the Space Shuttle could deliver that the Russians could not or would require a separate cargo launch. Russian cost increase finally starts to make the shuttle economics realistic. 2011 - NASA announces design for the next generation of heavy lift U.S. launch system, the Shuttle “derived” Space Launch System (alternative to the Constellation program's ARES-V), capable of cargo and capsule lift. The Orion capsule continues from the Constellation program as the NASA capsule of choice for use beyond low-Earth orbit. 2012 - America has no access to fly humans into space and will not have a capability until at least 2015. 2012 - NASA budget at 6/10 of 1% of the total federal budget. "the greatest contributor to risk in the space program, both human and financial, is seeking to accomplish extraordinarily difficult tasks with resources inconsistent with the demands of those tasks"
To the general public, human spaceflight is the face of NASA. When numbers are tossed around that NASA’s budget is sixteen billion a year many assume that it is all for human spaceflight. It is not. Manned space takes a little more than a third of NASA’s operating budget. Within that budget NASA has to operate the present infrastructure while constantly planning a new one. That takes resources and money. Those who follow space and the current Presidential candidates lament at the lack of an American launch vehicle. The current Administration can point to former President George Bush as the one who set a date for the end of the Shuttle program. While it could have been extended, a once or twice a year schedule would have been expensive and risky. Retiring the shuttle was probably the right thing to do, but not having a replacement on the drawing board at least a decade ago is inexcusable. However, it was the only option NASA had available given its constraints. The Romney plan calls for reshuffling the current pieces, no increase in funding, and magically it turns out better. It is true that NASA has lacked a clear mission, but this type of plan should worry every space follower. The approach that NASA can transform into the world leader in human spaceflight without additional funding shows a fundamental lack of understanding of the problem. One thing Presidential leadership has shown us with the space program is that NASA is the girl everyone wants to take to out on a date, but never thinks about calling again the morning after. The only way a Romney plan works is if everything else goes. While we focus on human spaceflight, let’s not forget that America is THE undisputed leader in robotic exploration of the solar system. It’s not even close. I for one am not ready to concede that leadership position. It cannot be an either or choice. American space leadership requires continued human and robotic exploration. I was a little skeptical at first of the Obama plan for the reliance of commercial vehicles to get American astronauts to low Earth orbit, but it is the right approach. The important things in human space exploration will take place beyond low Earth orbit so let’s put our resources there and built a heavy lift vehicle and buy seats off the shelf to get us to the things we will build in space. NASA needs more funding, but the approach needs to be different. First, we need to recognize and reward NASA for its success. Robotic missions like the Mars Rovers and Cassini are delivering extended value and need to be allocated increased funding rather than be cut to reallocate their dollars. Second, the way NASA is budgeted doesn’t make sense today. It isn’t run like a typical government agency or a business. If the Defense Department needs a new fighter it is funded separately as a project. We don’t cut troop strength or mothball a Carrier to fund it. NASA is unique in its mission, but the approach to managing it is akin to fitting a square peg into a round hole. It doesn’t work, it hasn’t worked and it work won’t no matter how persistent we are at trying to make it work. Think of it like this, you work in a factory, but the owners say they need to expand and build a new factory to replace the old outdated one. They can’t afford to do both so they layoff every person at the factory to have the money to build a new one. Does that make sense? Of course not, that’s bad business and the fault of the owners for not planning for capital improvements. The owners would typically set aside capital funding over time to build the new plant without disruption to the business and do it so that the transition was seamless. NASA can’t do that, so it must have the government equivalent of a capital funding plan. What’s happened to NASA is that the government is closing the factory every few years. This is inefficient, wasteful, and the agency loses key intellectual talent and highly complex skills that it must continually rebuild. The right approach is for the President and Congressional leaders to fund a separate “above and beyond” budget designed specifically for infrastructure and launch platform design. This budget would allow NASA to strategically plan for future launch platforms without having to pick and choose which existing programs to cut. A billion dollar a year set aside would keep America always on the leading edge of space with top notch resources, facilities and vehicles to maintain our leadership in space. We need a creative, sustainable and different approach to NASA. In looking at each candidate’s plans, the Nixon curse of focus on expense and not goals still seems to be the norm. What has history taught about support and a vision for NASA? It is all about timing. The grandest visions of Presidents for NASA and space exploration rarely pan out. Not since 1961 after Kennedy's moon speech have both parties been united on a common NASA goal. Nixon arrived at a point in history of transition and weakness in support for space and his actions have proved the most lasting and damaging. Several President have tried to turn it around, but failed. From Reagan, Bush Sr, and Bush their visions never left the drawing boards of Earth. For this election, given history and the way NASA is funded, it is equally important to find out where your local Congressional leadership and candidates stand on the future of NASA. Turning NASA around and back to being focused on goals won’t happen on NASA’s existing shoestring budget no matter how the pieces are rearranged. The election of 2012 does not feel like a Kennedy or Nixon moment in history where the President, Congress, and the public's support converge to set a bold new course for America in space. Rather, it sounds a lot more like the status quo of the past 43 years, It’s going to take all of us motivating our leaders to support NASA to have a chance of seeing Americans set foot again on another celestial body. Your timeline on Defense Department involvement with Space Shuttle development and operations is not correct. the Earth. The objectives defined by the Air Force were simply the same mission elements of the original Dyna-Soar spacecraft from the previous decade. agency's missions unless both NASA and the Air Force had money in their budgets. No single agency "paid for" the Shuttle. "Reagan's NSDD-42 designated the space shuttle as the primary launch system for the US national security space program. It directed DOD and NASA to develop the shuttle into a fully operational, cost-effective system. All government payloads were to be compatible with the shuttle, and DOD was given priority on shuttle launches. DOD and other government agencies were to continue to develop and use expendable launch vehicles (ELV) only until the shuttle could meet all their launch needs. This directive essentially placed all of DOD's launch eggs in one basket--the shuttle. By making the shuttle the primary launch vehicle for all government payloads, NSDD-42 guaranteed NASA all the launch business it could handle. NASA's goal was to achieve a two-flight-per-month routine that would make satellite launches cheaper and make the shuttle a self-sustaining venture. To achieve this goal, NASA needed more shuttles. In the next four years, NASA launched three more shuttles, Challenger which first flew on 4 April 1983, Discovery which first flew on 30 August 1984, and Atlantis which first flew on 3 October 1985. Even with all four shuttles going at once, NASA was unable to meet its schedule because of technical problems and other delays. Far from the goal of 24 flights a year, the best NASA ever managed was nine flights in 1985. " PS - I would have liked to have seen a Shuttle launch from Vandenberg, but even without the Challenger accident that was likely to never occur. The earliest launch would have been 1991 after a review found "significant technical and structural" problems with the site. The most glaring was the Shuttle exhaust ducts. Rebuilding those was deemed a "major construction effort" and would have not been ready until 1989 at the earliest with additional testing and prep. In short, the shuttle's technical complexity, costs, inability to maintain a steady launch schedule, Challenger accident, and the problems with Vandenberg sealed the fate of DOD commitment to use the shuttle. It was Reagan's revamped space policy post shuttle that had already seen the writing on the wall for the shuttle/DOD alliance.